You must make reservations at least 5 minutes in advance of the time at Akbar - Baltimore. 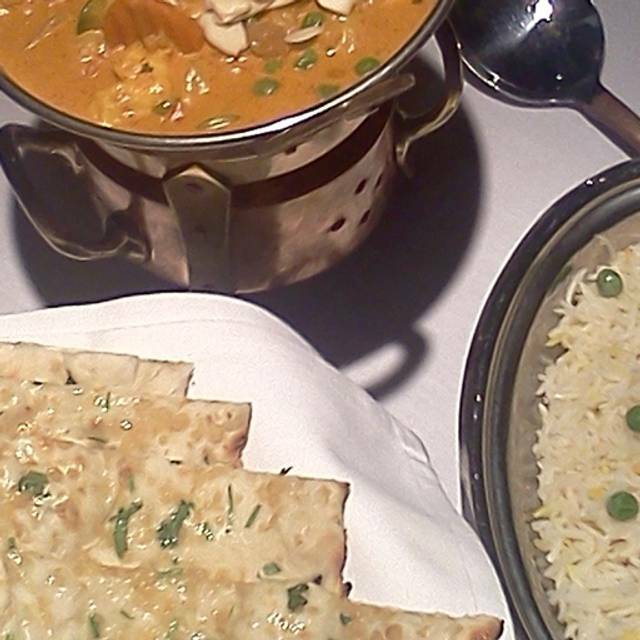 For over 31 years, Akbar Restaurant has been serving Maryland with the finest array of dishes and gourmet masterpieces, coupled with renowned service. Now, as we enter our 32nd year as Baltimore's premier Indian restaurant, we'd like to thank all our customers for truly making Akbar, Baltimore's Finest Indian Cuisine. The best curry leaf flavored potato pankakes you will ever eat. A tasty combination of appetizers. Chicken tikka, lamb seekh kebab, tandoori shrimp and a piece of salmon served on lettuce, tomato and onions. Boneless chicken pieces, potatoes and onions mixed in tamarind sauce sprinkled with mango powder and black Indian salt, served cold. Sweet corn soup made with chicken and spices. Nan bread stuffed with ground chicken or lamb and spices. Chicken wings in a special batter, deep fried. Crisp spiced patties with ground lamb stuffing. The famous soup made from Lentils, simmered with spices and served with a wedge of lemon. Thinly spiced onions, deep fried in a flour batter. Cubes of homemade cheese dipped in special batter and deep fried. Crisp flour crackers mixed with chopped potatoes, chickpeas and onions. Topped with yogurt, tamarind and hot spices, served cold. A rich flat bread stuffed with nuts and dried fruit and baked in a clay oven. Whole wheat buttered layered bread baked with fresh mint. Crisp turnover stuffed with potatoes and peas and topped with chickpeas, yogurt and spice. Ground lamb, onions, peppers and spices, roasted in oven and served as appetizer bits. Crisp spiced patties with vegetable stuffing. Marinated cubes of lamb charcoal broiled tandoori style. Tender Chicken supremes marinated in garlic, ginger, and green coriander. Boneless chicken portions marinated and roasted tandoori style. Mixture of minced lamb or chicken, onions and herbs, roasted on skewers. Chicken pieces marinated in yogurt and roasted in the tandoor oven with lavish blasting of chilli-coriander sauce. Cubes of homemade cheese marinated and cooked Tandoori style. Shrimp lightly seasoned and broiled over charcoal in our tandoor. Chicken marinated in yogurt, spices, herbs, and barbecued in the tandoor. Assorted delicacies from our charcoal fired tandoor. Boneless chicken pieces cooked in traditional spices and curry sauce. Boneless tandoori chicken cooked with Punjabi style sauce, bell pepper, tomatoes and a little cream. Boneless chicken cooked in butter with garden vegetables. Ground chicken, deliciously flavoured with browned onions and cardamom. Very mildly spiced chicken flavoured with coconut and simmered in yogurt. Highly spiced chicken curry from South India with a touch of cinnamon. Tandoori chicken pieces cooked with onions, tomatoes, butter and cream. Boneless chicken cooked with fenugreek, herbs and spices -- a specialty. Marinated chicken pieces cooked with cream spinach, coriander, and a blend of spices. Tender boneless chicken tikka pieces cooked with spices in butter sauce. Chicken pieces and potatoes cooked in hot and tangy curry sauce. Sliced boti kebab cooked in a piquant sauce with tomatoes and onions. Minced lamb balls stuffed with cashew nuts and raisins and cooked in curry and cream sauce. Cubes of lamb covered with sauteed onions, green peppers, and a touch of garlic and ginger. Ground lamb cooked with peas and spices. Cubes of lamb marinated overnight and cooked with spices in mild sauce. Lamb cubes marinated and cooked with nuts in cream sauce. Cubes of lamb and potatoes cooked in hot and tangy curry sauce. Pronounced 'Sha-ku-tee' - A spicy lamb curry from the west coast of India made with roasted cocunut and a blend of rare spices. Lamb pieces marinated and cooked with ginger and garlic in mild spices. A traditional lamb curry covered with chopped onions, tomatoes and freshly ground spices. Lamb cooked with cream spinach, coriander and herbs. Long grain special rice cooked with lamb and seasoning. Special rice cooked with sliced lamb, chicken, shrimp, and a mixture of freshly ground spices, almonds & raisins. Classic dish of Akbar cooked with chicken, nuts with safrom flavoured rice & raisins. Long grain rice cooked with shrimp, safron, and seasoning. A real treat for the gourmet. Safron rice blended with garden fresh vegetables and nuts. Succulent pieces of crabmeat simmered in onions, tomatoes, fennel seed and touch of green coriander in cream sauce. Fish cooked with ground coconut in a mixture of spices and herbs. Lobster cooked in very mild cream sauce and flavoured with coconut. Tandoori prawns cooked with spices in butter sauce. Shrimp cooked in spices with touch of ginger and garlic. Large shrimp sauteed with bell pepper, onions, tomato, and spices. Shrimp cooked in delicate spices and creamed spinach. Highly spiced shrimp in sharp and tangy sauce. Cauliflower and potatoes cooked with onions, tomatoes, and delicated spices. Fenugreek and potatoes cooked with herbs and spices. Eggplant baked, mashed, and seasoned with herbs. Green okra cooked with onions, tomatoes, herbs, and spices. Chickpeas, onions, and tomatoes cooked in tangy dry sauce. Lentils, full of flavor and nutrition, flavoured with freshly ground spices and sauteed in butter. Mild flavor, yellow split lentils sauteed with onions, ginger and spices. Perhaps the most popular North Indian dal. Mushrooms and potatoes cooked in mild spices. Mixed vegetable rounds in an onion and tomato sauce. Home made cheese gently cooked with tender peas and spices. Home made cheese cooked with fresh spinach, seasonings, and spices. A great Indian dish made with cottage cheese, peppers and a blend of spices. Home made cheese cooked in tomato and butter sauce. Vegetable dumplings in a savory yogurt curry. Fresh vegetables and cheese cooked with mild spices and sprinkled with nuts. Garden fresh lettuce, cucumbers, and tomatoes. Chopped fresh tomatoes, onions, cucumber, and green pepper in mild vinegar and lemon dressing. Thin pieces of crisp lentil bread. Freshly made yogurt spiced with diced cucumber and tomatoes. Vegetable samosa or choice of soup, tandoori chicken, chicken tikka, rogan josh, dal, onion kulcha, and pullau rice. Assorted delicacies from our tandoor, mixed vegetables, pullau rice, and nan bread. A variety of vegetarian dishes served with rice, dal, raita, samosa, poori, gulab jaman, in a traditional Indian serving tray. Unleavened bread stuffed with mango chutney. Whole wheat layered bread stuffed with potatoes and baked in tandoor with butter. Round whole wheat bread baked in tandoor and served hot. Fresh baked white bread topped with garlic and butter. Unleavened bread stuffed with minced lamb or chicken and baked in our tandoor. Unleavened bread freshly baked to order in clay oven. Bread stuffed with spiced cheese. Whole wheat layered bread, baked in tandoor and topped with melted butter. Whole wheat flour puffed bread deep fried. A light pastry made by milk and honey served in thick sugar syrup. Choice of safron pistachio and mango ice cream. Traditional rice pudding with almonds and raisins. The traditional Indian ice cream made from thickened milk with taste of almonds and pistachio and a touch of rose water. Cottage chese and milk flavoured with rosewater and garnished with nuts. Our special brand tea made with cardamom and cinnamon. A sweetened yogurt drink with a touch of kewra water. A great little spot located to so much in the Baltimore area. Easily walkable from the BSO's Meyerhoff Hall and various other attractions. Owners are wonderful, service is great, food is beyond amazing. Check it out! Enjoyed our dinner before our show at Center Stage, a short distance away. Akbar is my favorite Indian restaurant in the Baltimore area. The food and service were amazing. We felt like we were treated like family. The owner even greeted us and made sure everything was going well. Food was amazing. Flavors were great, and everything was cooked just right. We had the Tandoori Salmon, Pishori Pasanda, and Chicken Xacutti; the server was careful to check in with us about the spice level, and it was lovely. We had several appetizers as well, and our party was negotiating over who got what, because everything was just so good. The food was yummy as usual. And the service impeccable. These helped to make an outstanding evening. Great service and tasty food! Definitely coming back! The food was delightful, and the service was outstanding. It was very welcoming, peaceful, and an enjoyable experience. I definitely plan to return to try more tasty items on the menu! seems like the overall past excellent experience has declined. food not as tasty as in past. has a tired feel to it. other newer Indian restaurant near Loyola much better food and ambience. Our dinner at Akbar was delicious, gracious, delightful....consistent as always! A pleasure! We have been coming here for five years as a couple. We went on our first date here and continue going on our anniversary. The food is delicious and very affordable. It is shady restaurant, begin with the front door to restroom, in basement. To me foods are horrible, if you are Asian Indian, i am sure you will find that too, although pallet differ person to person. At least I tried all the foods but my friend even bother to try after first 4 foods. This is the worst restaurant I ever been. It has a cozy, intimate setting and the food was amazing. When we got the bill we were surprised how cheap it was. That never happens! Good food and comfortable setting. I would recommend to a friend or family member. This is our second timing going and both experiences were pleasant. I arrived late for my reservation--got lost in traffic--and indicated I was attending the concert at the Meyerhof. The staff graciously prepared my meal quickly enough that I actually ended up having time for dessert. Great place to get together with larger groups! The food is fantastic! I’ve been coming to Akbar for authentic Indian cuisine for almost 20 years now. I always get the same thing (Chicken Tekka Masala, garlic naan bread and veggie simosas for my appetizer) and I must say, this last experience was even better than I remembered! They outdid themselves with their Tekka Masala sauce; to the point where I was still stuffing my face long after I was already full. Keep up the amazing work coming out of your kitchen, Akbar! You never disappoint! Excellent service and authentic Indian cuisine. I ordered the Punjabi Kadhi and it reminded me of home cooking. Can’t wait to go back! Authentic Indian cuisine,done right.And they are very accurate at tailoring the spice level to the diner’s preference. Awesome food. Good Service (always with a smile). Quiet atmosphere. Lamb Vindaloo and Shrimp Vindaloo were spicy but really tasty. The Chicken Tikka Masala was also quite good. I have been coming here for years, on and off, and it never has disappointed. Outstanding Indian food in a lovely, quiet setting. Great for romance or semi formal events. The food is excellent! I’ve been here many times and will definitely return again. Excellent Indian cuisine in buffet. Perfect for Sunday brunch’s. Consistently excellent.....food and service, a true neighborhood gem! We had an amazing time! Fantastic service, delicious food, exactly what I had hoped for. Wonderful experience! Our family has been dining at Akbar for nearly 30 years-it was where we celebrated graduation from kindergarten for my now grown sons. Food as great as ever, the best palak paneer I've ever had, and of course, our kid's favorite: wonderful Chicken Tikka Masala. Gracious wait staff. Great leftovers, too! Fantastic, heartfelt food. Great location. Can’t recommend enough. Akbar was one of our favorite restaurants when we lived in Baltimore and it didn't disappoint. It was good to see familiar faces and items on the menu. We love the cozy atmosphere and delicious food. A great restaurant for delicious and authentic Indian food. Akbar has always been one of my favorite restaurants and my visit on Valentine’s Day was extra special. The food was perfectly spiced (I ordered the chicken sagwala medium) and the portion was hearty. My date enjoyed his chicken tikka. Service was very attentive as always. I really love the ambiance of Akbar. It’s a smaller restaurant and with the brickwork and candles on every table it is very cozy. For Valentine’s Day they presented me with a rose at the end of the meal which was a lovely touch. I hope to return soon to enjoy more delicious food! This is some of the best authentic Indian food I have had in a very long time. I have never been to Akbar before. We went for the lunch buffet and it was amazing. We will be back again very soon. Food was excellent and served in a timely fashion. The service was acceptable but somehow indifferent. Beautiful room, quiet, excellent food. Wide variety of choices on menu. They also seem to do a great take-out business. This was my first visit, and I was impressed with the spice level of the Shrimp Vindaloo I had ordered. Service was efficient, and I was engaged in a serious conversation with my dining partner. However, the evening took three hours, and I had the sense that the waiter had forgotten us. I took my vegan son to this restaurant for Thanksgiving. It was lovely. The people were attentive and helpful and the food was great. White tablecloths and nice decor lent a festive atmosphere. Many Vegan choices. What's not to love? The food was quite good. Service was very attentive. Would recommend. .